Warehouse workers strike for a 15% pay increase, but much more is at stake. Report and analysis from the picket line. By Achille Marotta, originally posted on Notes from Below. 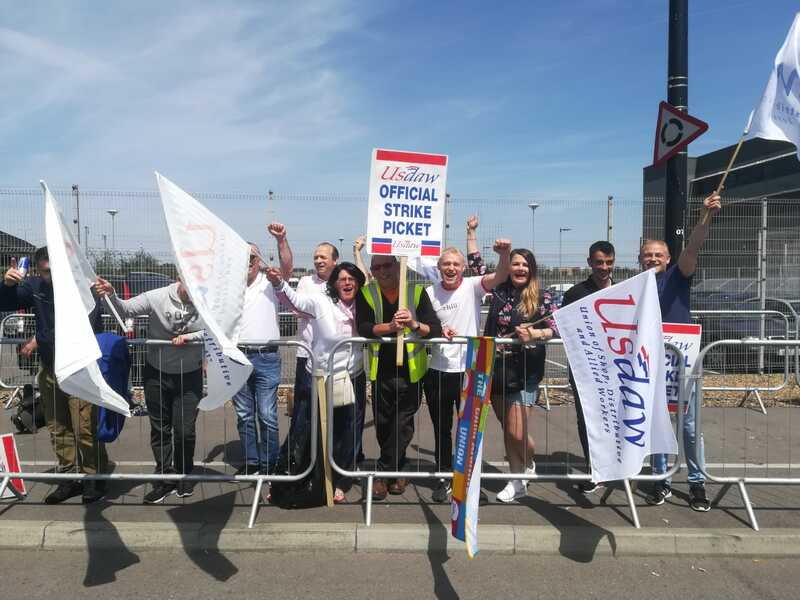 Warehouse operatives, drivers, and office workers at Tesco’s distribution centre in Dagenham were on strike for 24 hours from Thursday the 17th to Friday the 18th of May. The workers, organised in USDAW, are demanding a 15% pay increase against the company’s offer of 3%. Reps claim that the strike has had an effect on Tesco’s finances, as the warehouse is a central point in the distribution network of an enormous amount of necessary commodities. While the company could easily afford to give into the demanded £1.39 pay rise, it preferred to lose money re-organising its distribution network to prevent the Dagenham strike from becoming a beacon of struggle to its half a million employees. What is really at stake is the potential for a new movement in the modern centers of working class concentration. One of the largest Tesco distribution centres in the UK, the Dagenham site was built in 2013 and employs about a thousand workers. “They take advantage of the high unemployment in the area”, one striker told us, “this warehouse was billed as a golden ticket for the community”. Dagenham’s industrial park - which once serviced massive factories such as Ford’s plant of 40,000 workers, now reduced to 3,000 - may be infrastructurally and geographically convenient for the supply of London’s supermarkets. But these are not sufficient conditions for the construction of a Tesco distribution centre. What is also needed is a population ready to meet performance targets and work excruciating hours for below a living wage, in temperatures varying between 1 and -21 degrees celsius. This workforce is overwhelmingly composed of men under 35, striking for the first time in their lives. While about half of the 80 or so workers standing on the picket at the time of our visit were born in London, the rest are from Eastern Europe, especially Romania. The latter are less represented among the union reps, but they are younger and more vocal, shaming picket crossers in their own language. Agency staff compose about a third of the workforce but make minimum wage as opposed to the £9.75 of direct employees, with an overtime rate kicking in only after 48 hours of work instead of after 37.5 hours. This coercible, easily sackable workforce is the secret behind the industry’s ‘flexibility’ in response to consumer demand. But none of them are on strike. As for direct Tesco employees, the company has booked a red double-decker bus to drive scabs past the picket line, but it mostly comes back empty. Tesco employees are not immune to ‘flexibility’ either. According to one of the strikers, it’s just a three week process between not meeting targets and getting the sack. The turnover rate is so high that over 6,000 workers have passed through the warehouse in the past three years. According to Dagenham workers, the turnover rate also partly results from low pay in one of the most expensive regions of the country. 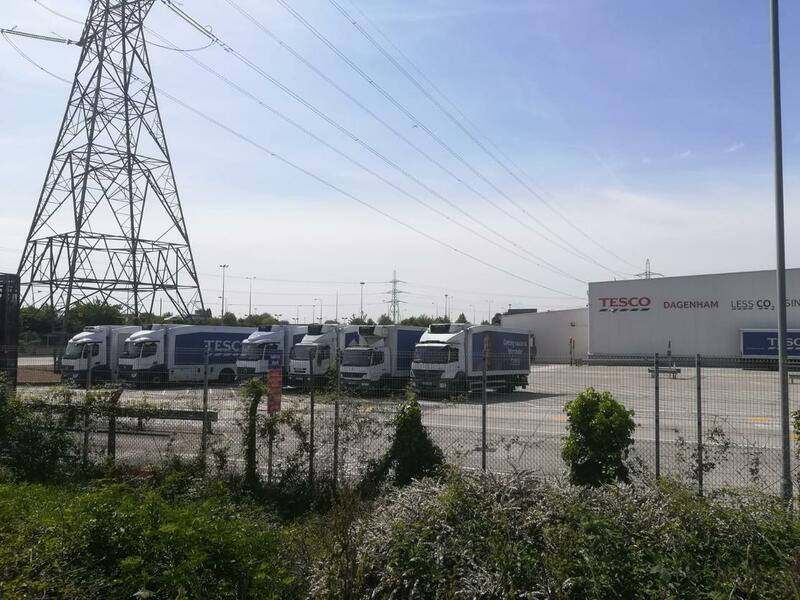 Strikers are demanding pay parity with another Tesco distribution centre five miles away in Thurrock, which pays £11.47 for essentially the same work. “We pay for the same loaf of bread, the same pint of milk. So why are we getting less?” Their sentiment reflects that of female Tesco shop floor workers claiming back pay for earning £3 less an hour than mostly male warehouse staff. While some users on the independent Tesco workers’ web forum Very Little Helps used the gender pay claim to undermine the ‘greedy’ strikers, the Dagenham workers themselves were supportive of their colleagues and affirmed women’s right to pay parity. In their opinion, the trolls are posting straight from the Tesco central offices. The claim for a Dagenham pay rise was put forward by union reps last summer, only to face repeated rejections by the company. According to the reps, they didn’t have to convince union members to take up strike action: “Tesco did it themselves... some of these people can’t afford not to strike”. One migrant warehouse worker said he began to see that management weren’t on his side when they refused his proof of illness for sick pay. It was the reps’ support in his grievance which gave him trust in the union. The popularity of the union and the move towards strike action is also made possible by the fact that Dagenham is a “standalone site”, which means it’s not part of the USDAW-Tesco "partnership agreement" introduced in 1997. While this agreement is billed to increase union membership, in reality it takes power away from workers, who lose the vote they would otherwise have over pay-deals and conditions. While the union works “in partnership” with the bosses, workers are consoled with management-controlled “staff forums”. Pickers and drivers we spoke to at another Tesco distribution centre which fell under this agreement had a far bleaker view of USDAW, despite their hatred of management and their enthusiasm for the Dagenham strike. In spite of the scab trucks sheepishly driving through the booing crowd, reps assured us that the warehouse was down by at least 80% capacity. What is more, the strike has had an effect far surpassing the 24 hours of work stoppage. In the past two weeks since industrial action was announced, Tesco moved 1.5 million boxes of food to other distribution centres in Snodland, Didcot, Peterborough, and Southampton. These in turn had to move their work to other warehouses, creating a domino effect with a material impact on the working day of thousands of Tesco staff as well as those who work for supplier companies. Even as strikers returned to work on the Friday night-shift, their workload was minimal, as the fresh food supply chain could not be reorganised in time. The strike was said to affect up to 80% of Tesco Express stores in London, whose low stocks in the “just in time” system of distribution depend on the Dagenham warehouse operatives and drivers. Although data on the real effect of the strike on these stores is still hard to come by (workers I talked to at Express stores in East and Central London didn’t report any shortages), we can say with confidence, together with the Dagenham reps, that the strike has hurt Tesco’s wallet. But this lost income, even if it was the millions, is not a priority for a company which makes over a billion pounds in profit. When 70,000 supermarket workers went on strike in Los Angeles in 2003-4, the companies were happy to lose $2.5 billion before the strike was defeated. At the end of the day, the long-term interest of these companies lies in suppressing workers’ power. Consider, for example, Tesco’s system of logistics, which besides its ‘flexibility’ in relation to market supply and demand, proves its true usefulness to the bosses when a warehouse goes on strike and work is shifted to other sites. The company is given even more power by the current labour laws, which force unions to announce official strikes at least two weeks before taking action, allowing Tesco ample time to reroute its commodities. We’ve seen a similar situation in the last decade in Italy, where warehouse workers' strikes against distribution and logistics firms such as IKEA and DHL were undermined when companies simply reorganised their distribution networks through their many warehouses scattered across the region. Workers - organised in fighting unions such as SI Cobas - responded through regional and national strikes. At the same time, the use of scabs and ‘self-employed’ drivers was prevented through blockades which stopped trucks from entering or leaving the warehouses. Although this tactic is just as illegal in Italy as it is in the UK, workers and their supporters were protected from prosecution by the sheer power of their rebellion in such a central point of the economy.1 This movement is still on the rise, and has dramatically improved the lives of tens of thousands of workers, with pay rises of up to €400 a month and a newfound dignity and respect in the workplace. As we left the picket line and waited at the bus stop, a man caught up with us. He was a striking Tesco worker, and had recognised our comrade V. from a factory where they used to work together. They made small talk, and on the bus he spoke about a bit about working conditions and the strike. He had come to realise that the hummus he packed in Dagenham was the same one he used to produce at the factory, the same plastic tub countless people reading this article have purchased at Tesco. The power of the Tesco strike lies here. The concentration of capital has turned distribution firms into “chain leaders” of a global factory farm, with companies like Tesco and Walmart dictating the prices and production of their suppliers on an international scale. The system may have destroyed small grocers and producers, while degrading our quality of life, but at the same time it has created massive centres of potential working class power at the edges of our cities. If the work was not just stopped in Dagenham, but in Snodland, Didcot, Peterborough, Southampton, Thurrock and other warehouses, it would stop the work of thousands of agricultural and manufacturing workers supplying the goods to Tesco, not to mention the mass of store workers in London and the Southeast. The Asda-Sainsbury's merger is the latest step in the competition of these firms to secure both monopoly of distribution and monopsony of production (a situation where a firm is both the only seller of goods, as well as the only buyer from suppliers). Besides hurting workers in those companies through potential job losses and pay cuts, the merger will also affect Tesco staff and other supermarket workers, who will be caught in the crossfire of price wars and the ensuing “rationalisation” of the work process. If the Dagenham strike continues and secures its pay rise, it will send out a signal to other Tesco and supermarket workers to organise against the imminent bosses’ offensive. Retail and logistics workers are a central point of the current class composition, and their struggles can be the rebirth of the mass working class movement. But for this to occur, they must grow deeper - by the inclusion of agency staff through mass meetings and more militant tactics - and wider - by spreading through regions and firms along the supply chain.